This is no mere action game you’re reading about. It isn’t even ‘just’ a very good one. It’s a bona fide, genre-defining, once-or-twice-a-generation Big Deal; the game Naughty Dog has always threatened to make but never really delivered. The Last of Us’ storytelling is as important a part of the experience as any element of its gameplay. In fact the two are so intertwined that it’s impossible to separate one from the other. 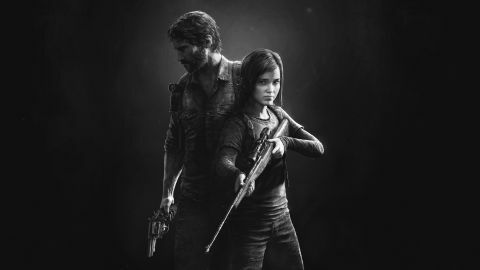 After years of bold claims from multiple parties, it could be argued that The Last of Us is the first truly mature interactive narrative in the action genre. As such, it’s a genuine landmark, and an utterly fitting representation of the seventh console generation's last chapter. And if you haven't had the joy of playing it on the PS3, the Remastered edition for the PS4 is something you need to experience straight away. Already familiar with The Last of Us? Check out the new boxout and gallery below, which detail all the perks that come with playing on the PS4. New to The Last of Us entirely? Read on. Beginning 20 years after a mind-controlling fungus parasite has devastated humankind, The Last of Us finds protagonist Joel as broken, hardened, and locked-down as the world around him. Being a man of advanced years, he’s one of the few characters in the game with a clear memory of the world before the outbreak. He spends his days trying to exorcise the loss that haunts him, burying the past and acknowledging only the daily struggles of the present. Immediately it’s clear that The Last of Us is a very different beast to what we’re used to from the genre. Naughty Dog unapologetically replaces Uncharted’s charismatic action-movie bluster with underplayed, slow burning grit. Where once there were sparky archetypes and gleaming, stylised environments, now there are closed, flawed, almost unlikeable people inhabiting a grimy, mundane, painfully realistic urban nightmare. It’s only when Joel is tasked with delivering 14-year-old Ellie to an underground movement known as the Fireflies that his journeys, both geographical and personal, begin. Alright, if you've already played through The Last of Us on the PS3, is it worth picking up the Remastered edition? That depends entirely on how much you liked it the first time around, and if you feel it's something you'd revisit. Remastered's shift to 60fps means combat feels MUCH more fluid, and the game is, of course, prettier than the original--as of now, it's the prettiest console game available. Add to that a new difficulty mode and all of TLOU's DLC packs, and it's a hell of a deal. That said, if you didn't love it the first time around, prettier visuals and extra content probably won't sway your opinion. While the meat of the action takes the form of brutally demanding encounters with the human and less-than-human threats inhabiting the no man’s land outside of America’s fortified cities, that’s literally and figuratively only half the story. The Last of Us is billed as "survival action," and the ceaseless realisation of the former concept makes every second of the game a thrilling, emotionally pounding and intellectually nourishing experience. Built around a solid stealth system driven by line-of-sight, The Last of Us’ action encourages an entirely player-driven approach to almost every encounter. Provided he can scavenge the gear needed to build and feed them, Joel has a healthy array of potential tools at his disposal, ranging from firearms to Molotov cocktails and nail-bombs. The most powerful weapons he has though, are thought and tactical adaptation. And that makes every encounter in the game fresh, exciting, terrifying and deliciously unpredictable. Wide, sprawling, multi-leveled environments encourage and reward creative play at every turn. All of Joel’s tools have great versatility, able to be used directly or more cleverly for misdirection. While not really a traditional stealth game, direct confrontations, even with the rarity of a fully loaded gun in hand, are unwise. Emphasising the worn-out, desperate state of the world, ammo is in painfully short supply, even from enemy drops. With no fancy silenced weapons available, firing even a single shot is akin to sending up a flare inviting enemies to Joel’s location. Instead, it’s best--and far more satisfying--to play cat-and-mouse with the sophisticated AI, using its knowledge of your last location to herd it around and manipulate its behaviour, hanging on by your fingernails to stay just one step ahead and maintain an advantage. It’s as exciting to the brain as it is to the adrenal gland. The items that fuel the crafting system require studious searching of the environment to acquire. And even when you have the bits, crafting takes real, in-game time. As does using the manual healing system, assuming you’ve made enough health kits. Go into a fight unprepared, and finding a safe place to resupply becomes a life-or-death challenge in itself. Wondering how The Last of Us Remastered improves an already excellent game? Here are the differences you can expect to find in the PS4 release. No other console game has yet to match the visual quality of The Last of Us Remastered. The jump to native 1080p resolution means all characters and textures look better than ever, and you'll immediately notice the improvements to shadows, lighting, draw distance, and overall detail. Arguably the biggest difference between Remastered and the original is the default framerate of 60fps. This translates into much smoother action and exploration sequences, making aiming in particular feel much less clunky. You can also choose to lock the game at 30fps for increased shadow quality (pictured above) if you prefer. Here's a cool new tool coming to Remastered via a day-one patch: a Photo Mode, which lets you take a screenshot (only during non-cutscene moments), play with its angle, and edit it before sharing with friends. More info here. If you haven't played The Last of Us since its release, that means you haven't yet played through its outstanding single-player DLC, Left Behind, which chronicles Ellie's life prior to the events of the game. Remastered comes with this included, in addition to two multiplayer map packs. Months after the release of The Last of Us, Naughty Dog put out a documentary about the game's development process. This documentary, entitled Grounded, will be watchable via the in-game menu after you've installed a day-one patch. Be sure to do so, it's super interesting. You can enable director commentary for the game's cinematic scenes, providing an additional behind-the-scenes look at The Last of Us' many touching (and harrowing) moments. Commentary features TLOU creative director/writer Neil Druckmann, voice actor Troy Baker (Joel), and voice actress Ashley Johnson (Ellie). That’s the wonderful thing. This isn’t a set of separate, isolated elements. It’s made up of a whole stack of disciplines and possibilities, working together organically to create a deep, layered, ever-changing, and constantly stimulating whole. Options are always open, every move has an equal risk and reward, and with no rules or penalties governing your approach, any decision that keeps you alive is the right decision. But with Ellie by Joel’s side throughout, each choice comes loaded with a weighty sense of responsibility. But as stated, that’s only half of the story. Because part of the reason The Last of Us’ violent encounters remain so tooth-rattlingly affecting is how sporadically placed they are throughout the game. The resonance of the (necessarily) brutal violence never dissipates through over-repetition, but more so, the slow-burning nature of the game’s pacing infuses every encounter with immense emotional weight. This is a game of extended, ambient travel sequences and powerfully underplayed character development. The vast, gorgeously decaying vistas of a world reclaimed by nature are a constant reminder of both the weight of Joel and Ellie’s quest and the necessity of vigilance and violence at all times. They’re also a source of visual wonder, bringing out joy and confusion in Ellie while reminding Joel of a better past. In these quieter sections, be they meandering environmental puzzles in which Joel finds ways for the less capable Ellie to progress, or simply lengthy treks through the urban wilderness of a society long-since collapsed, the immense quality of the game’s writing and performances really shines. The slow exploration of an abandoned town might spark up equal excitement and sadness in Ellie as she discovers the long-dead remains of a world she never got to know. Her playful instinct might take over as she explores an abandoned neighbourhood while Joel hunts for supplies. And the game’s narratively minded treatment of even mundane tasks ensures that the frequent scavenging never becomes tedious busywork. Apparently empty areas are often the ones most packed with content. Not much might seem to happen while exploring a deserted plaza for gear, but these are the times that ambient, environmental storytelling will most frequently trigger quietly significant exchanges between the two leads. As such, the high stakes, low resources and knowledge that anything could be around the next corner feed directly into the importance of each and every trinket found. You only survive by what you bring to the equation, giving every life-saving bomb or trap a personal significance. Particularly if the parts used to build it came from the hands of a dead family making a similar survival bid to Joel and Ellie’s. There might be a great deal of downtime between the action, but the game never rests. It’s the interplay during minute, delicately sketched events like these that brings about the many subtle interactions through which the characters’ personalities and viewpoints gently rub off on each other, gradually but completely transforming the two and their relationship. Ellie’s curiosity at a world Joel is trying to forget slowly forces him to modify his outlook and actions, while his weary, coldly logical demeanour starts to inform Ellie’s approach. And all of this feeds straight back into both gameplay and tone: Ellie’s hardening makes her an increasingly useful combat aid, while also raising uncomfortable questions about what she might be turning into--questions you’ll be forced to address every time she bricks an enemy in the head to help you stay alive. It’s a violent game, but also sometimes a game about violence, and that’s a rare and worthy achievement indeed. Yes, The Last Of Us does have a competitive online component, and it’s far from the hastily cobbled together addition some might expect. Rather, Factions mode proves itself to be surprisingly adept at crafting thoughtful team deathmatches. Split into two modes (Supply Raid and Survivors) two teams of four players are pitted against each other with a finite number of lives. In the former, each side has 20 lives rationed out between its members; the first team to wittle the other’s number down to zero are declared the winners. Survivors goes one further and completely does away with respawns all together over desperately tense three minute rounds. Compliments to Naughty Dog for creating a multiplayer that defies convention and focuses on slow-burning strategy. The emphasis is very much on survival first, reckless killing a distant second. In that sense, Factions captures the ideology of single-player beautifully, even if it is unlikely to capture the COD crowd. If you're planning on jumping back into multiplayer in the PS4's Remastered version of the game, be aware that your PS3 progress won't carry over. It combines DNA strands from across the genre, yet reworks and recontextualises them to become far more than the sum of its parts. Its storytelling is peerless, as affecting and multi-layered as it is grounded, underplayed and real. In terms of everything the modern action game has strived to be, The Last of Us is the full-stop at the end of the sentence, leaving no more to be said. Until next-gen. If this is our starting point for that, then the next five to ten years could be truly amazing. Description A man and a teenage girl a traverse a nightmarish, post-apocalyptic American wasteland in this cinematic survival-horror game from Naughty Dog.